Independent Private Instruction (IPI) is – and should remain – a viable educational option in Iowa. 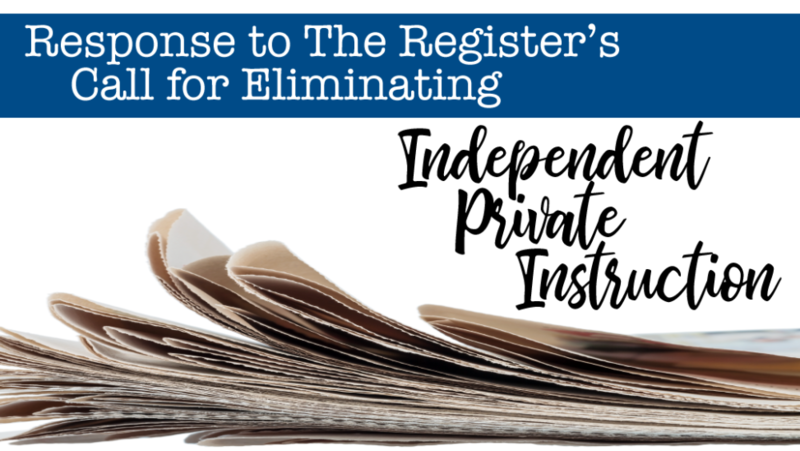 Homeschool Iowa stands in direct opposition to a March 7th Des Moines Register editorial, which attempted to use unsupported, misleading arguments to call for the elimination of IPI. and increased rates of child abuse or death. In March of 2018, researcher Brian Ray, PhD, released a comprehensive study on these issues, available on the National Home Education Research Institute website. In fact, this data clearly indicates that preschool-age children (not homeschooled children of compulsory school attendance age) are, by far, the highest risk group for abuse fatalities. Yes, opponents of home education have been quick to call for increased government oversight of homeschooling families following the tragic abuse fatalities sited by The Register. Yet, in both of these cases, government child protective services were already involved but failed to prevent the deaths. to reduce these tragic fatalities. This opinion, however, is only supported by unsubstantiated and provocative rhetorical statements. Instead of basing their opinions upon unconfirmed hypotheticals, we invite The Register’s editorial staff to attend our Homeschool Iowa Graduation, where authentic homeschooling parents award high school diplomas and where actual homeschooled student accomplishments and future plans are showcased. Rather than reasoning from unsubstantiated conjectures, we invite The Register’s editorial staff to read about real homeschool graduates, like Dr. Elizabeth Cook, whose story was highlighted recently in our Homeschool Iowa blog. Iowans support opinions based upon facts and evidence. Homeschool Iowa shares The Register’s desire for quality education for our children and for effective measures to reduce tragic childhood abuse and fatalities. We, however, believe that parents have the God-given right and calling to raise their children and that IPI should remain as a recognized, proven Iowa educational option. Homeschool Iowa also supports research-based means to reduce childhood abuse and fatalities – none of which include the elimination of Independent Private Instruction. We call upon The Register to join us in basing its opinions upon these facts. I am outraged at the proposed legislation that promotes elimination of the IPI in Iowa. There are several reasons families choose to homeschool. Our family has chosen to homeschool because of the lack of academic excellence in our small, rural, and poor school district. Last year, our family studied the life of Booker T. Washington. One of the ideas that stuck with me was his observation of his time in slavery – he did not necessarily experience the brutal beatings other slaves had endured, but the “brutality of ignorance” was forced upon him. We have considered sending our children to a public school for high school, but have chosen to continue homeschooling to pursue academic rigor. I have had several conversations with teachers, the principal, the academic coach, and school board members to try to understand the goals of the school district. I have asked if the school would support a debate team, participation in a regional science fair, or provide support for a speech competition such as is offered by the American Legion Auxiliary. Authorities in the school have noted that students graduate without having the ability to research, to think critically, to communicate effectively, and are only prepared to sign up for remedial science classes at community colleges upon graduation. Yet, they don’t want to participate in debate because it is too much work. They live in a small town, and the National Speech and Debate Association assigns topics that are irrelevant to them. The school offers a class called “Government”, but the requirement of the class is to learn to write a resume. Per leaders in the school, the Constitution is boring to kids. They offer a government class, but the students “debate” their opinions on topics.They offer the required literature classes, but much of the conversation (from what I’ve gleaned from conversations with students, faculty, and curriculum planners) deals with issues that are relevant to students today, i.e. teen suicide and mental illness. There are no conversations about issues others in the world face, issues to which they could provide solutions. Students are unprepared to meet the challenges that face them when they leave school. A leader in the school lamented to me that students are so lost when they graduate, a majority feel their best option is to try community college. Yet at the same time, I haven’t spoken with anyone who actually wants to change how they do anything. Thankfully, we are allowed to use the school to sign up to participate in the Iowa Speech and Debate Tournament. I am coaching my high school students, and will be sending them to a camp this summer to better prepare them for participation in additional tournaments next year. I know that the school doesn’t have a lot of money. Does the school really need more money, though, to focus more on research? In our homeschool, we have learned a lot and are preparing our students well for the future. In addition to the regular college mail she receives, my oldest daughter is receiving solicitations from several prominent schools requesting her to apply. A work ethic can be learned from diligent pursuit of the mastery of difficult academic topics. The principal remarked that he had never seen a PSAT score as high as my daughter’s. Money hasn’t purchased mastery of academic concepts. The institution of public education too often perpetrates the brutality of ignorance on its students. The elimination of the IPI would do nothing to solve the issues faced by the lack of accountability of the public schools.